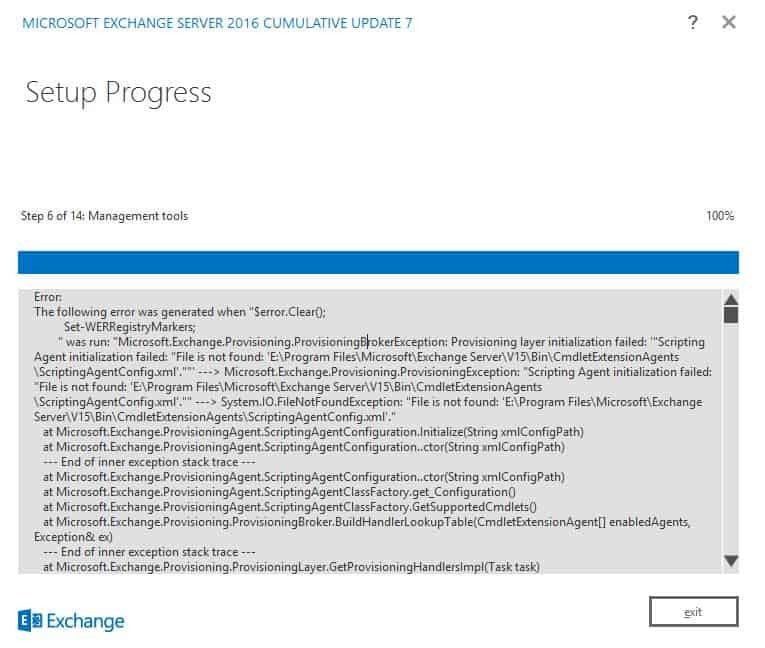 Scripting Agent Initialization Failed: "File is not found" error came up during an Exchange 2016 Setup into an existing Exchange 2010 environment. The error message is descriptive enough to make us understand that it is something to do with scripting agent within the Exchange environment. The scripting agent is not one of those features that every organization uses either. The issue here is that the Exchange 2010 has scripting agent enabled and while running the 2016 setup, it is expecting the "ScriptingAgentConfig.xml" file within the folder structure of the Exchange 2016 server. There are two ways we can go about solving the issue. Disable the scripting agent temporarily using the Exchange 2010 Shell (run Disable-CmdletExtensionAgent "Scripting Agent"). Enable the scripting agent back by running Enable-CmdletExtensionAgent "Scripting Agent" from the Shell. Copy the "ScriptingAgentConfig.xml" file from one of the Exchange 2010 servers. The location is C:\Program Files\Microsoft\Exchange Server\V14\Bin\CmdletExtensionAgents, assuming that Exchange 2010 is installed on the C drive. Paste it into the Exchange 2016 server that is giving the error, the location is C:\Program Files\Microsoft\Exchange Server\V15\Bin\CmdletExtensionAgents, assuming that Exchange 2016 is getting installed on the C drive. Re-run the Exchange 2016 setup. Have you come across this error at all? Any other workarounds to get past the error? Cloud Architect & Blogger with interests in Office 365, Enterprise Mobility & Security and Azure. I am active on Experts Exchange & TechNet forums and I am a technical author for SearchExchange. Follow me on Twitter, LinkedIn, Facebook or Google+ for the latest updates. For consultancy opportunities, drop me a line.